“There’s a flower somewhere in this desert…” Wajada started saying. “I knew it!” jumped Tenzin. Ilan and Wajada looked at Tenzin and smiled at her. 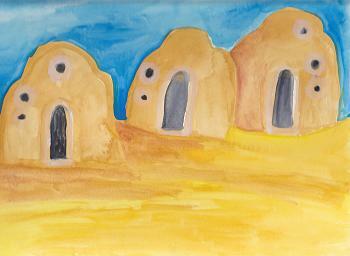 But Wajada had disappeared, and not only her, but also the dome and the whole village. She was now standing with Tenzin, in the very middle of nowhere. I like the shelters you painted. The doors seem to have a human shape to them. The idea of searching for a flower is very symbolic and in a desert…hmmm this is really good. I can really relate to what you are saying.